« Britain Banning Food Waste from Landfills? The Cleveland Browns will unveil a food-waste-to-energy scheme at this Sunday’s game. The storied, snake-bitten NFL team has installed pulpers to grind food waste on site before hauling it to a nearby anaerobic digester. This exciting news is part of the USDA Dairy Power program pairing dairy biodigesters with commercial food scraps. According to USDA calculations, if all NFL stadiums sent their scraps to an anaerobic digester (or composting facility), it would divert about 620 tons of food from landfills. Stadium food waste diversion would be a win-win. It would prevent those climate-changin’ methane emissions and likely save teams money by reducing hauling fees and tipping fees. (Depending on location, teams likely wouldn’t pay as much per ton at an AD facility as at a landfill). While pulping, or grinding, one’s food scraps is not revolutionary, it’s an encouraging first step. I can imagine one day having small on-site digesters that would eliminate the hauling and power stadiums. 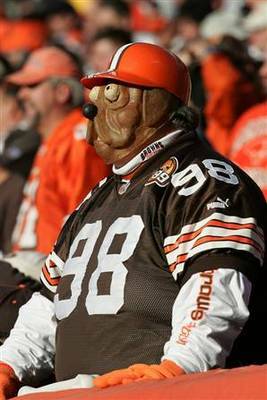 Given that the Browns play in EnergyFirst Stadium, that would seem appropriate. This entry was posted in Anaerobic Digestion, Composting, Energy, Events and tagged Cleveland Browns, food waste, football, grind2energy, Jonathan Bloom, NFL, TD for AD, Wasted Food. Bookmark the permalink. Both comments and trackbacks are currently closed.